1. Cut the crabs into half down the centre and cut them into 2 pieces. 2. Separate the claws and lightly crack them. 4. Saute the ground masala paste for 4 to 5 minutes. 5. Add the coconut milk, salt and lime juice. 7. Add the coconut and simmer for 3 to 4 minutes. 8. Now add the crabs and curry leaves. 9. 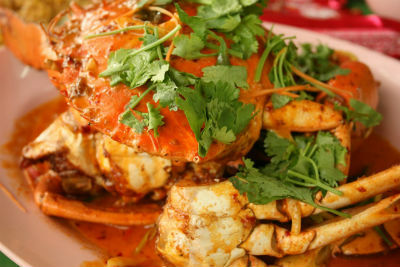 Cook for 5 to 8 minutes until the crabs are cooked and gravy is thick. 10. Keep stirring from time to time..
Feel free to comment or share your thoughts on this Sri Lankan Crab Curry Recipe from Awesome Cuisine.